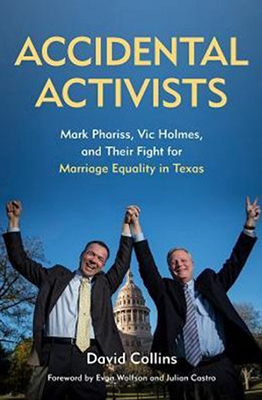 I reviewed Accidental Activists: Mark Phariss, Vic Holmes, and Their Fight for Marriage Equality in Texas (University of North Texas Press) by David Collins for Lone Star Literary Life. This is an important addition to a more complete understanding and appreciation of the history of all Texans, and Mark and Vic's personalities shine from the pages. Accidental Activists: Mark Phariss, Vic Holmes, and Their Fight for Marriage Equality in Texas by David Collins, with a foreword by Evan Wolfson, founder and president of Freedom to Marry, and Julian Castro, former Secretary of Housing and Urban Development and former mayor of San Antonio, is the newest volume in the Mayborn Literary Nonfiction Series from the University of North Texas Press. Accidental Activists is an important addition to a more complete understanding and appreciation of the history of all Texans. Collins’s writing is entertaining, employing a literary-nonfiction style that makes Accidental Activists read like a novel. Don’t expect neutrality; Accidental Activists is not journalism. Collins engagingly relates the biographies of “reluctant rebels” Phariss, a corporate attorney and human rights activist, and Holmes, a physician’s assistant, professor, and twenty-three-year veteran of the United States Air Force. Collins commands empathy as he tells the story of Mark and Vic’s eighteen-year relationship, a tale of breathtaking prejudice and dumbfounding ignorance, as well as a tale of passionate love, precious kindness, and enduring commitment. There are moments in Accidental Activists when the narrative threatens to bog down in legal terminology, quotes from Justice Antonin Scalia’s scorching dissents, and repetition, but such is the nature of the law, and proof of Collins’s exhaustive research. A more careful copyedit of this title before its next printing might fix the occasional typo, but one particular instance deserves note, to remedy likely confusion: incorrect citation of 2015 for the United States v. Windsor case on page 188 throws off the timeline and sent me scrambling to the index for the correct year, 2013. But for now, for just a little while, let’s enjoy Accidental Activists. Collins’s exuberant love of Shakespeare is infectious, and through his judicious use of anecdotes—no small number starring the beloved beagles (see photographs)—the personalities of Phariss and Holmes beam from these pages.